Israeli schools teach the Bible as real history. This means that Israeli children learn only its chapters, true or fictitious. When I once complained about this in a Knesset speech, demanding that the full history of the country throughout the ages be taught, including the chapters of the Crusades and the Mamelukes, the then minister of education started to call me “the Mameluke”. Last year I mentioned a book about death from an atheist perspective that has been getting wide attention among various Freethought and other blogs. 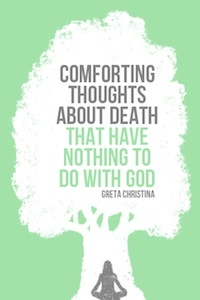 My first reaction when I learned about it . . . .
Another book that did not interest me personally but that I see is gaining considerable attention on the web is Greta Christina’s Comforting Thoughts About Death That Have Nothing to Do with God. Personally I have no problem with the idea of death as the cessation of everything. But evidently we all have different perspectives on this and Greta’s book does meet a wider interest. And given its electronic version only costs $3 I thought, “what the hell” and have downloaded it for future reference. Now I can find out what all the fuss is about when I have a spare moment. I’ve been an atheist long enough and I have long since worked through my questions about the “meaning of 42” and godless foxhole deaths that I felt little personal interest in reading it at first. But it’s a bandwagon thing. I had to find out what everyone else thought I was missing, so I read it. I managed it easily in my spare moments — walking to/from work; waiting for someone in a car — and it was the best $3 I’ve ever spent since my $3 haircut in Bali. Greta Christina is a pleasure to read. It’s always nice, too, to read someone of a like mind about the fundamentals of life. One always hopes little gems will be tucked away in one’s mind and available for future reference when next conversing with anyone who wants to talk about stuff like this. There are two audiences (or two additional audiences) Greta is addressing here. For religious believers who are curious, especially if they are rethinking their own faith, this book is a perfect layout of the healthy atheist dispositions towards death and life. I was a little surprised to read that Greta is also addressing an apparently not insignificant number of atheists who seriously thought religion is the better option when it comes to facing death. I don’t know too many of those, or at least I don’t know if I do know any such people. I have scarcely been aware of atheist communities and related support groups, in particular some tailored to offer support for anyone finding well-meaning (or sometimes less kindly) religious people burdening them in their times of grief with overwhelming religious sentiments. Greta’s mentioning of these reminded me how lucky I am that atheism is not the big deal in Australia that it obviously is in America. Greta writes with humour, compassion, understanding and simplicity. It really is a great $3. You’ll remember and talk about it as long as you would the very beautiful hairdresser giving very good $3 haircuts in Bali.